The flavour of Mountain Dew was originally developed in Marion, Virginia, however the brand as we know it now began in Knoxville, Tennesse in 1948. 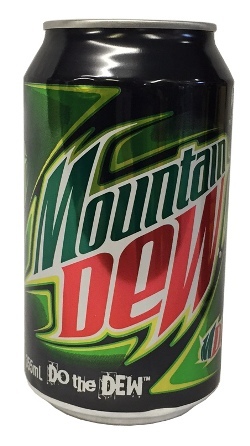 Mountain Dew was acquired by PepsiCo group in 1964 and is now one of the best selling soft drinks in the world! Carbonated Water, Sugar, Reconstituted Orange Juice, Food Acids (E330, E331), Flavours (Citrus & Cola), Preservatives (E211, E202), Caffiene, Colour (E102). I have tried both the US and UK version and they just don't compare to this New Zealand Dew. It contains real sugar and tastes how Mountain Dew should really taste like anywhere, amazing! Hopefully Sanza will import the other flavors from NZ as well. The first time I tried this was in America and ive loved it ever since! Now I want to try to Australian one to see if it tastes different. Honestly, I cannot get enough of this drink, it's great unique taste and high caffeine content are what keeps me going! I would recommend this drink to anyone who likes sugary-caffeine filled drinks.